The Holynnian Empire is a nation led by Revolutionist Thomas Holynn on the continent of Asia. The Holynnian Empire's government is a Social Democracy with very libertarian social policies. Economically, The Holynnian Empire favors far left wing policies. The official currency of The Holynnian Empire is the Bitcoin. At 161 days old, The Holynnian Empire is a mature nation. The Holynnian Empire has a population of 475,704 and a land area of 6,000.00 sq. miles. This gives it a national average population density of 79.28. Pollution in the nation is a disaster. The citizens' faith in the government is completely depleted with an approval rating of 0%. After a war broke out between the United Arab Emirates and Iran, a small revolution began led called the Jericho Revolt. The revolt was led by Thomas Holynn and on April 20th, 2034, the Holynnian Empire was formed. 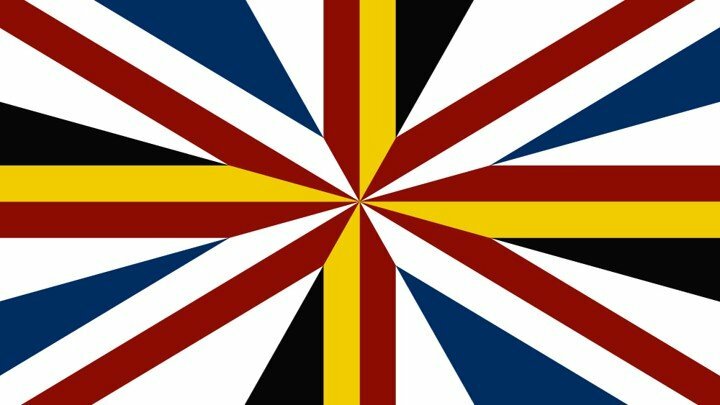 The Holynnian Empire's flag is made up of five colors, each one representing another part of the Jericho revolt. White, for Revolutionist Holynn. Black, for High Captain Freeman. Blue, for High Commander Herschel. Yellow, for High General Morse. Finally, Red, for the blood of the lives sacrificed during the Iranian-Arab War. 04/19 08:41 pm - Holynnian Empire had war declared by The Darkin Empire for the reason of "You're a disease, and I'm the cure.". 04/11 11:26 pm - Holynnian Empire had war declared by PIRA for the reason of "You're a disease, and I'm the cure.". 04/11 07:47 pm - Holynnian Empire had war declared by Greater Hindustan for the reason of "You're a disease, and I'm the cure.". 04/10 03:17 pm - Holynnian Empire had war declared by Cape Cod for the reason of "ppppppp". 04/01 03:25 pm - Holynnian Empire had war declared by Aesiir for the reason of "You're a disease, and I'm the cure.". 04/01 08:57 am - Holynnian Empire had war declared by Soviet Union CCCP for the reason of "Press F to pay respect". 03/30 04:27 am - Holynnian Empire had war declared by Victa Omnia for the reason of "You're a disease, and I'm the cure.". 03/29 01:03 am - Holynnian Empire changed their Color Trade Bloc from Gray to Black. 03/29 12:58 am - Holynnian Empire declared war on United Country of America for the reason of "I'm taking my rage out on you. Thx for understanding.". 03/29 12:58 am - Holynnian Empire declared war on Guyenroma for the reason of "I'm taking my rage out on you. Thx for understanding.". 03/29 12:57 am - Holynnian Empire declared war on Electric Valor for the reason of "I'm taking my rage out on you. Thx for understanding.". 03/29 12:57 am - Holynnian Empire declared war on United Lands for the reason of "I'm taking my rage out on you. Thx for understanding.". 03/29 12:56 am - Holynnian Empire declared war on Polish Nigeria for the reason of "I'm taking my rage out on you. Thx for understanding.". 03/25 09:25 am - Holynnian Empire had war declared by Omaria for the reason of "Inactive raid.". 03/25 04:08 am - Holynnian Empire had war declared by Westerosi for the reason of "The Lannisters send their regards". 03/24 08:43 pm - Holynnian Empire had war declared by United Kingdom of Canada for the reason of "I will have vengeance.". 03/11 12:40 am - Holynnian Empire had war declared by Bharat desam for the reason of "inactive raid pm for peace". 02/28 01:17 am - Holynnian Empire had war declared by _USSR_ for the reason of "Arrgh!". 02/27 10:32 pm - Holynnian Empire had war declared by Lothlorien for the reason of "Luke... I am your father.". 02/22 12:24 am - Holynnian Empire had war declared by 38Tsunami for the reason of "We like taking candy from babies". 02/17 03:49 am - Holynnian Empire had war declared by Dhagkuldihr for the reason of "I couldn't come up with anything better than that". 02/15 05:43 am - Holynnian Empire had war declared by Aliens From Outer Space for the reason of "Luke... I am your father.". 02/07 10:10 am - Holynnian Empire had war declared by Triten for the reason of "Loots Loots Loots Loots Loots Loots Loots Loots LOOOOTS". 02/07 05:50 am - Holynnian Empire had war declared by The Kingdom of the Bosporus for the reason of "good". 02/06 12:47 am - Holynnian Empire had war declared by Illuminnatti for the reason of "....". 02/01 10:17 am - Holynnian Empire had war declared by North Brisbane for the reason of "Grey raid nothing personal". 01/21 09:25 pm - Holynnian Empire had war declared by Republic of Helios for the reason of "You're a disease, and I'm the cure.". 01/21 03:10 pm - Holynnian Empire had war declared by Shuriman Empire for the reason of "Say hello to my little friend!". 01/21 11:43 am - Holynnian Empire had war declared by THE RISE OF ANTINIA for the reason of "A not-so-general dispute".